262 pages | 39 B/W Illus. The existence of environmental dilemmas and political conflicts leads us to appreciate the need for individuals and groups to behave strategically in order to achieve their goals and maintain their wellbeing. Global issues such as climate change, resource depletion, and pollution, as well as revolts and protests against corporations, regimes, and other central authorities, are the result of increased levels of externalities among individuals and nations. These all require policy intervention at international and global levels. 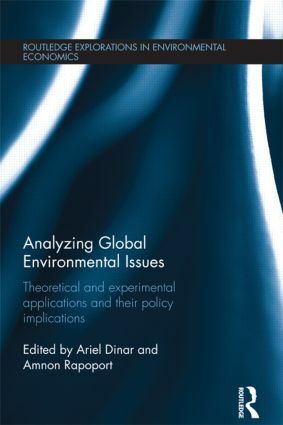 This book includes chapters by experts proposing game theoretical solutions and applying experimental design to a variety of social issues related to global and international conflicts over natural resources and the environment. The focus of the book is on applications that have policy implications, relevance and, consequently, could lead to the establishment of policy dialogue. The chapters in the book address issues that are global in nature, such as international environmental agreements over climate change, international water management, common pool resources, public goods, international fisheries, international trade, and collective action, protest, and revolt. The book’s main objective is to illustrate the usefulness of game theory and experimental economics in policy making at multiple levels and for various aspects related to global and international issues. The subject area of this book is already widely taught and researched, but it continues to gain popularity, given growing recognition that the environment and natural resources have become more strategic in human behavior. Ariel Dinar is Professor of Environmental Economics and Policy, and Director of the Water Science and Policy Center at the University of California, Riverside, USA. His teaching and research focus on environmental and resource economics and strategic behavior, and the environment at local and international levels. He publishes on issues related to the economics and politics of natural resources and the environment, with emphasis on water. Amnon Rapoport is Distinguished Professor of Management at the University of California, Riverside, USA. His research interests are in individual and interactive decision making. He has published several books and more than 200 book chapters and articles on sequential choice behavior, coalition behavior, dynamic pricing, route choice in networks, and bargaining.